On my last day in Chicago, I was craving Chicago-style deep dish pizza, but I didn’t have enough time before my flight to wait for an entire pizza to cook. Luckily, I was told that Giordano’s can “half-bake” a pizza for you so you can finish it off later without losing the texture and flavor typically lost in a reheated pizza. 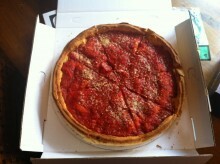 With this knowledge, I called Giordano’s up to order a half-baked medium with pepperoni. 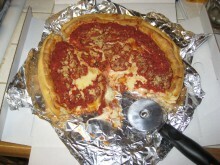 Giordano’s has locations throughout the Chicago area, with my pizza coming from the Evanston branch. I brought the 10-pound monster of a pizza on my flight back to Los Angeles and threw it in my fridge for the next day.